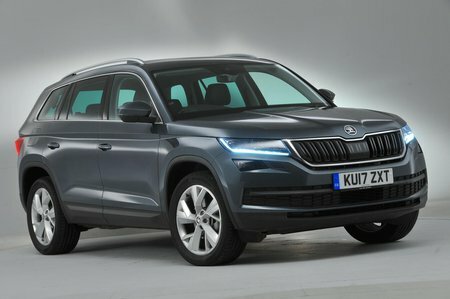 Skoda Kodiaq Boot Space, Size, Seats | What Car? This is a large SUV, so you’re unlikely to have any issues with feeling cramped – even if you’re a basketball player. Head room is copious and the front seats slide back a long way to accommodate anyone long in the legs, although the Kodiaq’s interior isn’t as broad as some of its rivals, such the Kia Sorento. Meanwhile, there are heaps of storage spaces; the door pockets are big enough to swallow a large bottle of water, there’s a cubby under the front armrest and one in front of the gearlever, which is designed specifically to stow your mobile phone. An optional Convenience Pack adds storage draws under the driver and front passenger seats for a reasonable price. Opt for the entry-level S trim and you can only have five seats, but upgrade to SE, SE L or Edition and there’s a choice of seven seats, too. Meanwhile, SportLine and Scout models have seven seats by default. 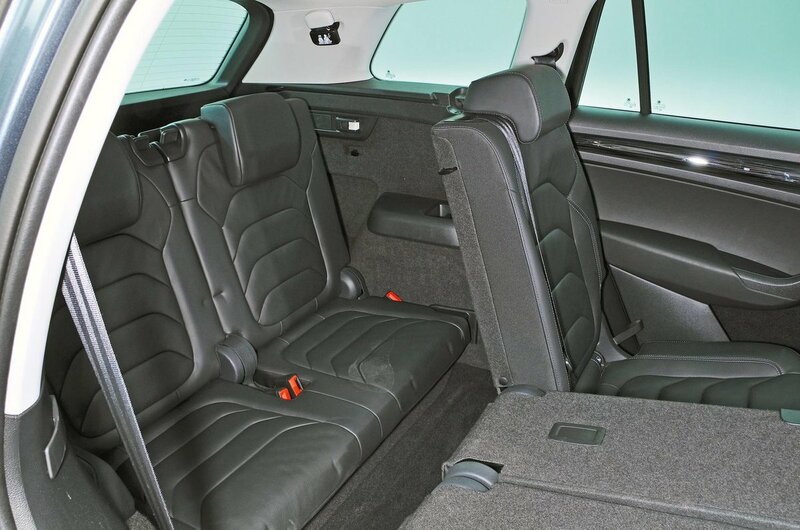 The second row of seats slides back and forth, but with them set fully back to maximise leg room rather than boot space, there’s a good amount of room for taller adults. That said, there’s not as much knee room as a Peugeot 5008; if you need something really huge, the Sorento is bigger still. 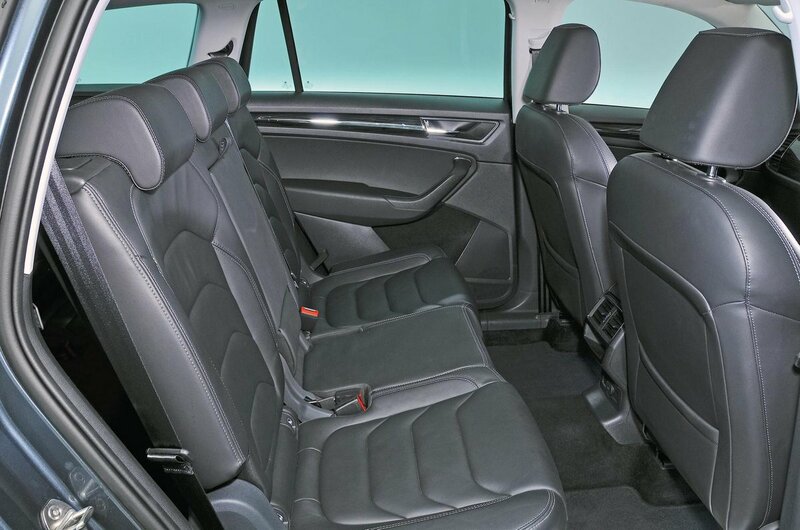 Both the 5008 and Sorento have greater interior widths as well, so are better for seating three adults abreast. The Kodiaq’s third row of seats (if fitted) is a lot less as roomy as that in a 5008 and certainly the Sorento. Small kids will be perfectly comfortable sitting back there, but teenagers and adults will have to cower to keep their heads from brushing the rooflining. Leg room is reasonable, as long those sitting in the middle row don’t slide their seats too far back. As we’ve already discussed, the middle row in the Kodiaq slides back or forth, but you can also adjust the angle of the backrests – handy when one of your passengers fancies a snooze. Not only does the middle row in the Kodiaq slide back and forth in a 60/40 split, but you can also adjust the angle of the backrests – handy when one of your passengers fancies a snooze. This recline feature and the folding of the backrests flat for long loads has a useful 40/20/40 split. The third row of seats (if fitted) stow away into the floor when they’re not required and are reasonably simply to erect. It’s worth noting that only the middle row of seats have Isofix mounts, although you can add this handy feature to the front passenger seat for a small premium. Five-seat versions (and seven-seat versions with the rearmost seats stowed away into the floor) have an enormous boot; we’ve squeezed nine carry-on suitcases in there. But a 5008’s boot is bigger and will take 10 suitcases, while the Sorento’s is so much longer and wider that it will take a stupefying 11. The floor of the boot is pretty much flat, as long as you’ve got the variable boot floor fitted and in its upper setting; this feature comes as standard on most versions.